Product Overview Introducing the WD Black 1TB NVMe SSD: the driving force behind everything you do. Featuring sequential read/write speeds up to 3400/2800 MB/s, and the innovative Western Digital NVMe SSD storage architecture, it's where blazing speed, top-tier performance, and Western Digital 3D NAND technology combine. With 600TBW and 1.75M hours MTTF, the WD Black 1TB NVMe SSD is the virtually invincible SSD you can rely on. 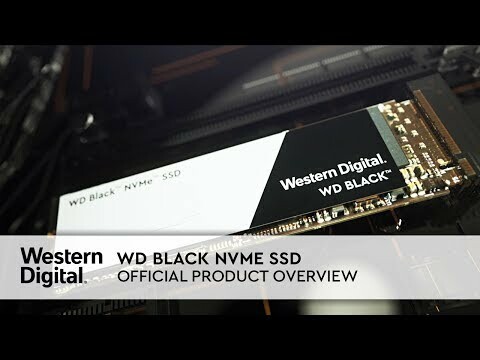 WD Black NVMe SSDs are available in an M.2 2280 form factor, perfect for building high-end gaming systems or high-performance tower desktops and laptops with support for an M-key connector. Western Digital puts our products through extensive Functional Integrity Testing (F.I.T.) prior to any product launch. This testing ensures our products consistently meet the highest quality and reliability standards of the Western Digital brand. No compromises. Nothing holding you back. The WD Black 1TB NVMe SSD features sequential read and write speeds of up to 3400/2800 MB/s for gaming, video editing, virtual reality, and beyond. Go ahead - do it all. The WD Black 1TB NVMe SSD is driven to keep up with even the most demanding workloads. Innovative power management and thermal throttling consistently help prevent overheating to deliver smooth, fast performance. Eliminate boundaries with Western Digital's new vertically integrated SSD platform. This innovative storage architecture features Western Digital 3D NAND, and is optimized resulting in low latency, power efficiency, and compatibility with the growing range of applications benefitting from NVMe. Create without limits. The WD Black 1TB NVMe SSD is certified by WD F.I.T. Lab for compatibility with a wide range of high-performance PC configurations - and comes with a 5-year limited warranty. Monitor your drive's available capacity, operating temperatures, SMART attributes and more with the WD SSD Dashboard. Acronis True Image WD Edition software, available as a free download, can clone drives and back up your operating system, applications, settings, and all of your data. 1TB WD Black v2, M.2 (2280) PCIe 3.0 (x4) NVMe SSD, 3D NAND, 3400MB/s Read, 2800MB/s Write, 500k/400k IOPS is rated 5.0 out of 5 by 1. Rated 5 out of 5 by KieAG from This drive is perfect and it has good read and write speeds. This drive in PCIe mode is absolutely fantastic I store all my games on it and the load times are faster than I thought. I love this drive. The pros are that it is fast and reliable The cons are the price it is a expensive drive for a 1TB I know it's a SSD (Solid-State Drive) and hard drives are Very affordable 1TB versions anyway.